Winemaker Adam LaZarre probably puts more mileage on his car than most people. He and his wife, Angie, run LaZarre Wines in Paso Robles, where they create a mere 1,200 cases a year of superbly crafted offerings from choice vineyards up and down the state of California. Adam also owns a crush facility in Monterey and another winery with a bottling line in Sonoma. The amount of back and forth driving must be dizzying. But, when you're a perfectionist and the final product is your only goal, nothing gets in your way. The Sonoma facility is aptly named Wine Hooligans, a tribute to the tomfoolery that not only got them into the wine business, but seems to keep them there and never let go. This bit of hooliganism is 100% Zinfandel from three diverse, but pronounced, areas in California: 65% Lodi, 22% Paso Robles and 13% Dry Creek Valley. The blend was aged 18 months in American oak. 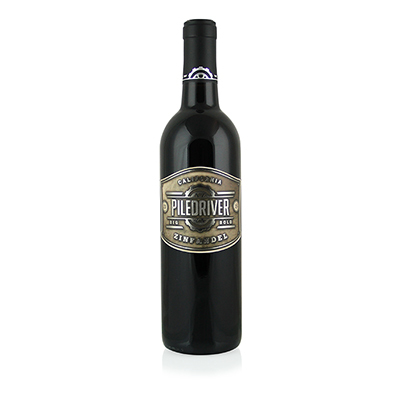 The Lodi Zin gives the finished wine its boldness and juicy flavors of black cherry, strawberry and plum; the Paso fruit adds lushness; and the Dry Creek the bestows a piquant finish. The prolonged oak aging softens the tannins, but not too much, and adds the cigar and cedar elements - along with spice and vanilla - to bring it all together. Piledriver is an apt name, as it is big and bold. Yet the quality of this wine maintains the integrity of the distinct soils from which it came.